On Wednesday, I took a group from Ashland to the mid-west, sort of. Visiting the nearby King Ranch near Unionville, PA is a little like being transported to Iowa, bird-wise. The King Ranch is a collection of privately-owned horse farms and agricultural area, mostly under conservation easement with the Brandywine Conservancy, assuring permanent protection from development. 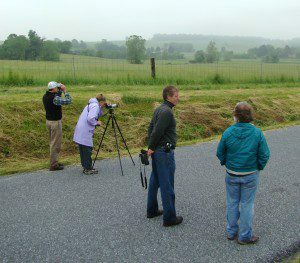 The area is about 40,000 acres in size and is probably the most scenic area of southeastern PA.
Our goal Wednesday morning was to see the nesting bird species that are tied to grassland habitat. Led by Kevin Fryberger from the Brandywine Conservancy, we ventured out to one of the best locations. We weren’t disappointed, immediately being surrounded by courting and singing Bobolinks, Savannah Sparrows, and Grasshopper Sparrows. 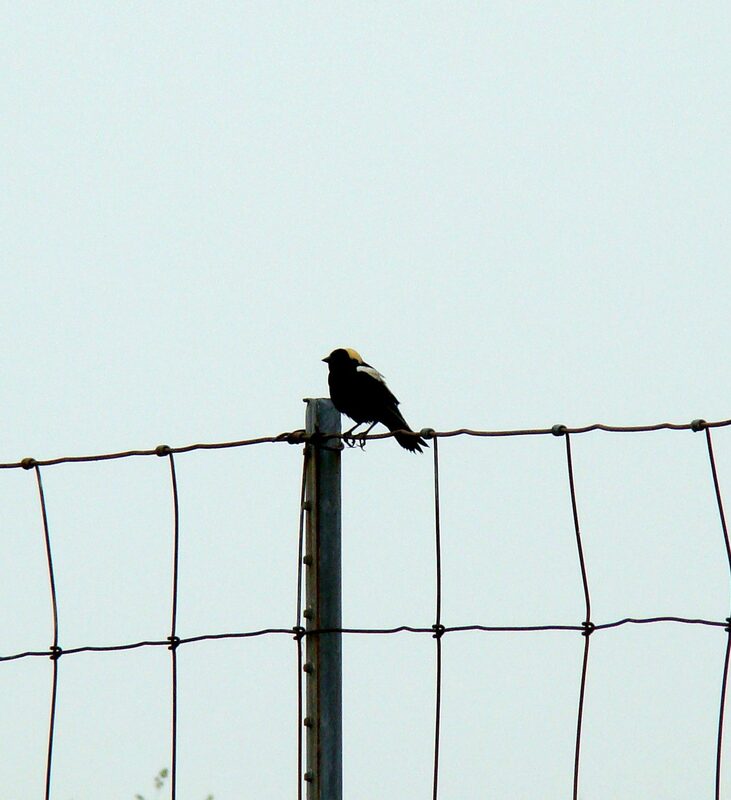 The call of the Bobolink, a white-backed blackbird, sounds a lot like R2-D2, and is one of my favorite songs in nature. Savannah Sparrows have not bred in Delaware in many years, but here they are fairly common breeders. Closing your eyes in this location with Bobolinks singing, and Savannah and Grasshopper Sparrows buzzing their insect-like songs, plus Eastern Meadowlarks and calling Ring-necked Pheasants, and you indeed think you are in the mid-west. Amidst this, another bird made an appearance that sealed the deal on our imaginary mid-west location. While looking at a perched Bobolink, another bird popped up. 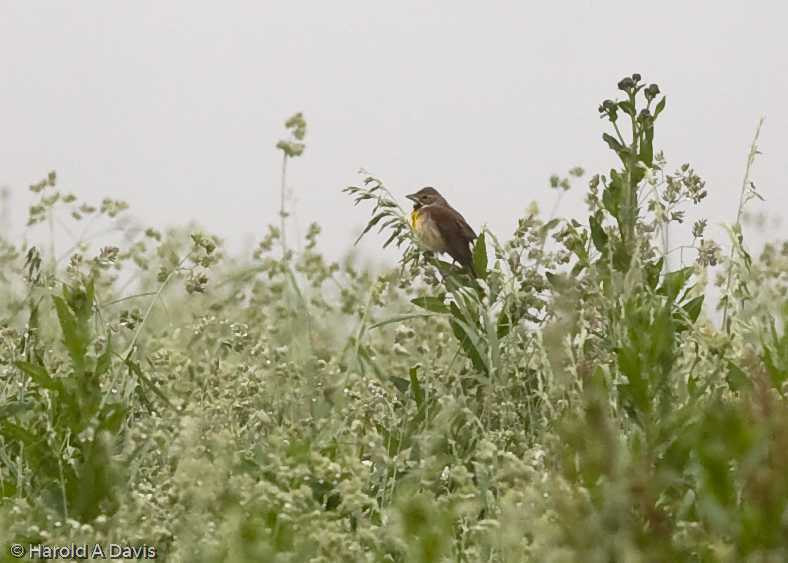 We got on it, and saw that it was a male Dickcissel singing. It was joined by a female a short time later. This species is truly mid-western in its normal range and sporadically visits and breeds in areas east of the Appalachians, but very, very rarely. If you get a chance, drive route 82 north into PA, through Kennett Square. Once you pass Unionville, you are in the King Ranch area. Keep your eyes out for all of these species as you drive the back roads of the area, and don’t forget to enjoy the scenery! The Question: If a tree falls in the forest, does it make a sound? Now, of course, the well-known caveat is if no one is around, does it still make a sound? On Memorial Day evening at 7:07pm, I was walking through the Ashland Covered Bridge when I heard a loud popping sound, followed by much snapping, then a loud whoosh, followed by a resounding splash! The entire noisy episode lasted about 5 seconds. 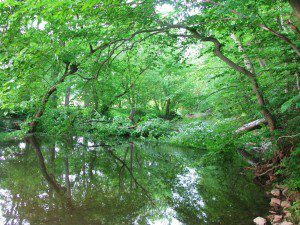 The fallen oak lays across(and in) the Red Clay Creek. I immediately followed my ears to the scene of the dendrologic disaster, knowing what I’d find. Two hundred yards downstream from the bridge, an old Red Oak(Quercus rubra) lay astride the creek. The tree’s trunk bore the signs of its ultimate demise: jagged orange splinters of cambium layer with a black heartwood. The inside of the tree is mostly hollow. The Red Oak, snapped and splintered, nows lays at rest. The oak, probably at least 125 years old, had rotted from the inside out. On this day, the old giant lost its grip on the earth, and came crashing down. 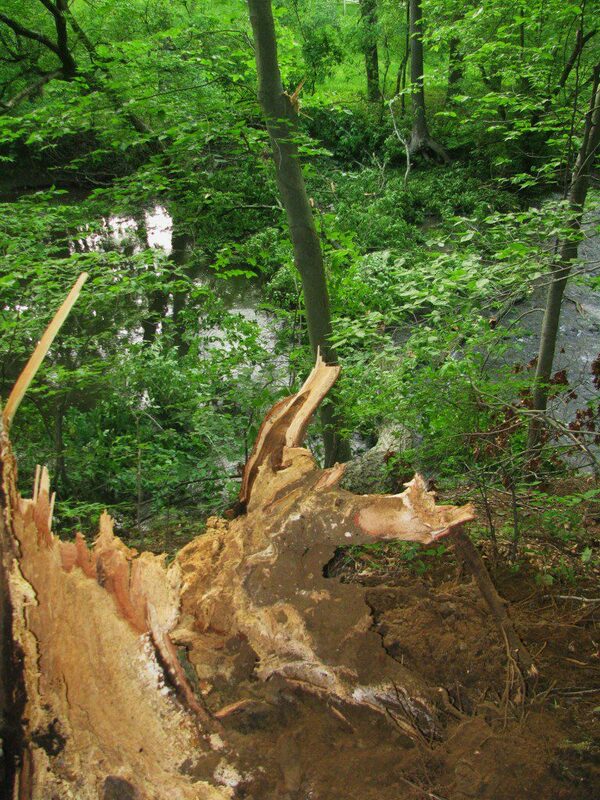 During its descent, the oak took out the top of a young American Beech(Fagus grandifolia) tree. 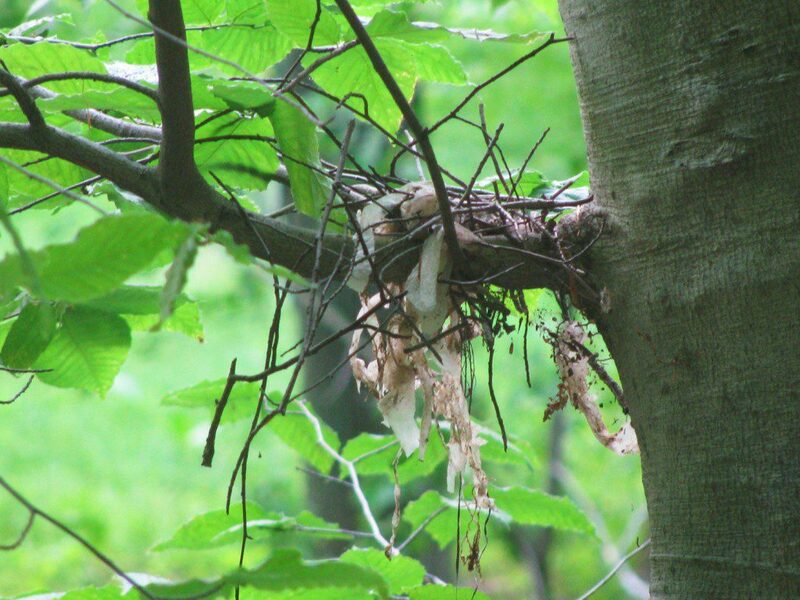 The bird nest, very much askew after the crash of a neighboring tree. I noticed something interesting in the beech tree, which turned out to be an unusual bird nest. I saw a mix of coarse twigs and strips of white plastic tucked against the trunk of the tree. What have we here? The pieces of the puzzle came into place: since the beech tree was struck squarely by the falling oak (shearing off the top of the beech), the entire beech shook with the force of the impact. The bird nest jostled and fell apart. At the base of the tree were more twigs from the nest, and a tell-tale feather. So who made the bird nest? I know the answer. Do you? Please share your thoughts and comments. Enjoy unraveling the mysteries of nature. And beware of falling trees! For the third year in a row, a pair of Sharp-shinned Hawk are nesting at the Delaware Nature Society’s Ashland Nature Center. 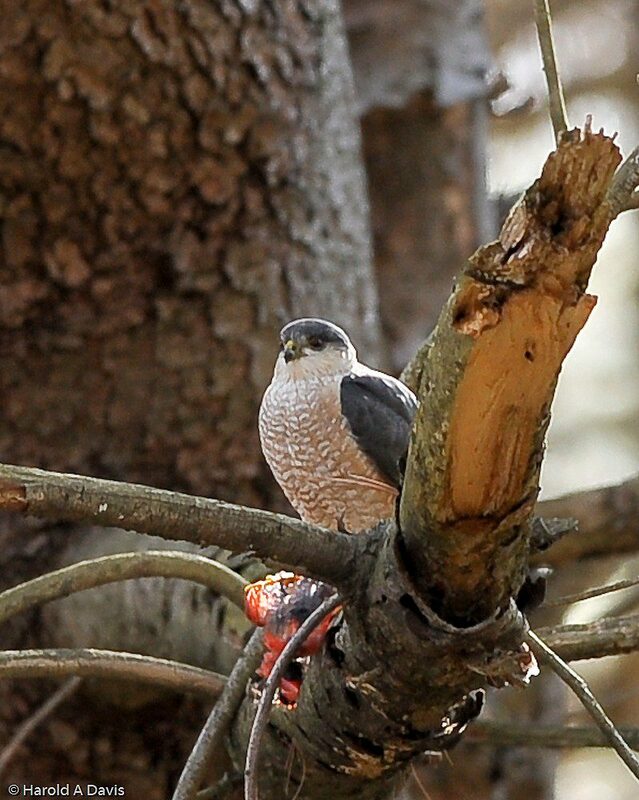 This is the only pair of Sharp-shinned Hawk to ever have been found nesting in Delaware. The normal range of the Sharp-shinned Hawk in eastern North America is up and down the Appalachian Mts. They are considered rare breeders in the Piedmont of Maryland and Pennsylvania, and now…Delaware. Sharp-shinned Hawks look like the bigger Cooper’s Hawk, which is a fairly common nesting species in Delaware. Sharp-shins are visibly different in slight ways from the Cooper’s, but the most noticeable difference is the voice. In fact, we discovered the pair by hearing them in April of 2007. For a comparison of Cooper’s and Sharp-shinned Hawk calls, click on the links at the bottom of the post. The Sharp-shinned Hawk pair nested here in 2007 and raised 3 young. In 2008, the pair nested in a different tree in the same woods and raised at least 2 young. This year, the pair are back, and are again nesting in a different tree, but in the same woods. Sharp-shinned Hawks nest in dense groves of pine. The pair at Ashland is no exception, and the nest is hidden high in the dense crown of a white pine tree. At this time, the female is incubating eggs on the nest. During the breeding season, she will do most of the incubation and all of the brooding of chicks. The little male, not much bigger than a Blue Jay, is busy hunting small birds to feed her. At midday, the male will usually take over the incubation duties from the female for a little while. I will keep you posted on how the Sharp-shinned Hawks fare this summer at Ashland Nature Center. The male Sharp-shinned Hawk was found eating a male Northern Cardinal during April. Notice that he is not much bigger than the Cardinal. Photo by Hank Davis. Knots and Crabs: Head to the Bay! 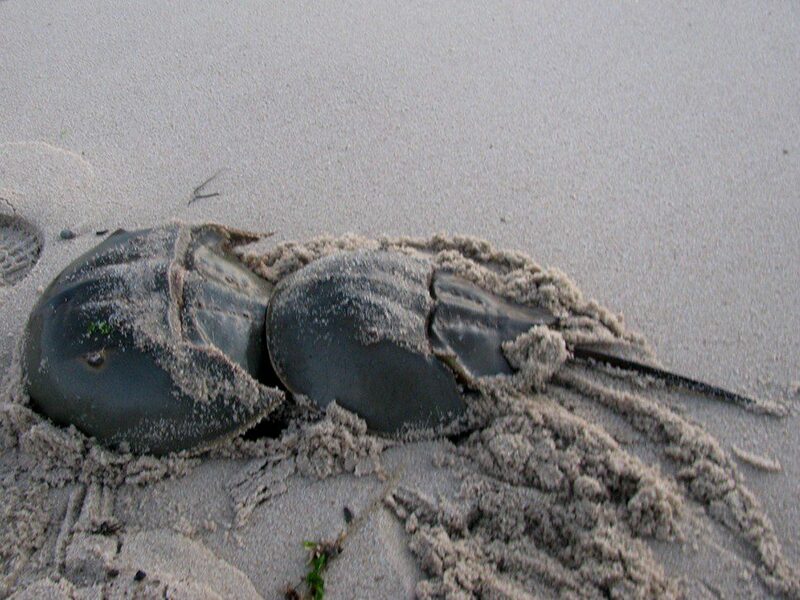 A pair of Horseshoe Crabs begin the spawning ritual. Prehistoric creatures with dagger-like tails and five pairs of grasping claws emerge from the depths of the ocean to crawl up on the edges of Delaware Bay beaches to spawn the next generation of saltwater-dwelling progeny. 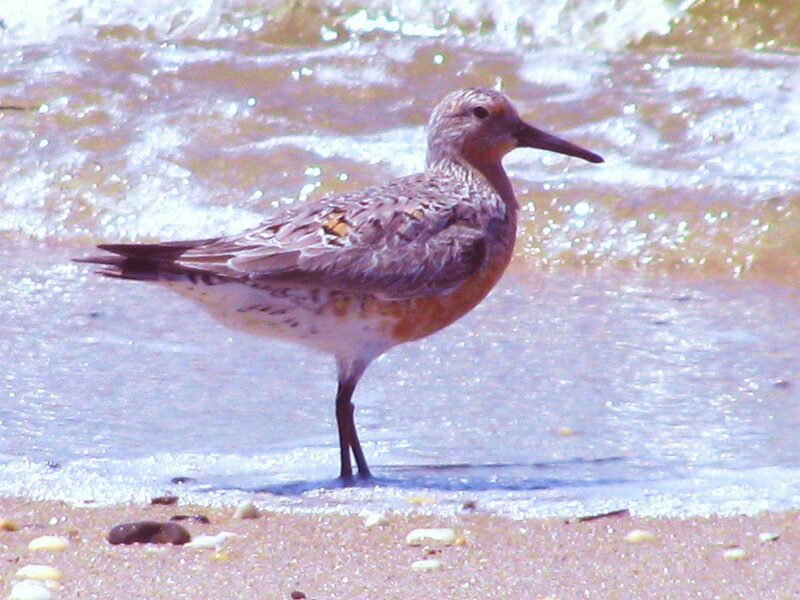 A Red Knot in a rare moment of rest. Meanwhile, at the other end of the hemisphere, flocks of chunky shorebirds take flight over the Atlantic Ocean. Using instinctual navigational abilities, these rusty-red birds with long wings will fly non-stop to their pinpoint destination: the sandy shores of the Delaware Bay. The players in this drama are the Horseshoe Crab and the Red Knot, as you may know already. One is an ancient relative of the spider that has a face only a mother could love. The other is a bubbly, active bird that is positively sharp-looking. Together, their lives are intertwined in one of nature’s great spectacles. Every May, they meet on the Delaware Bay. 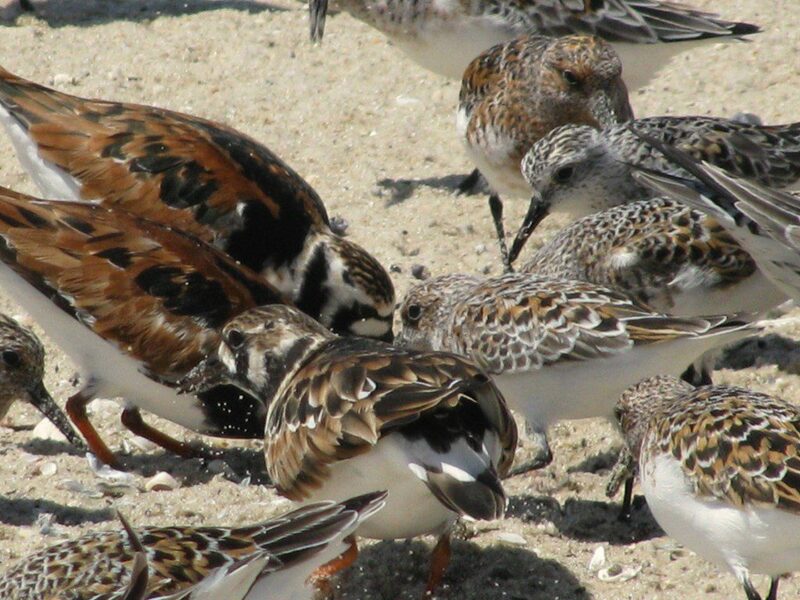 Ruddy Turnstones, Dunlins, and Semi-palmated Sandpipers make the sand fly as they probe for horseshoe crab eggs! The horseshoe crab and shorebird phenomenon is an internationally-recognized natural wonder. 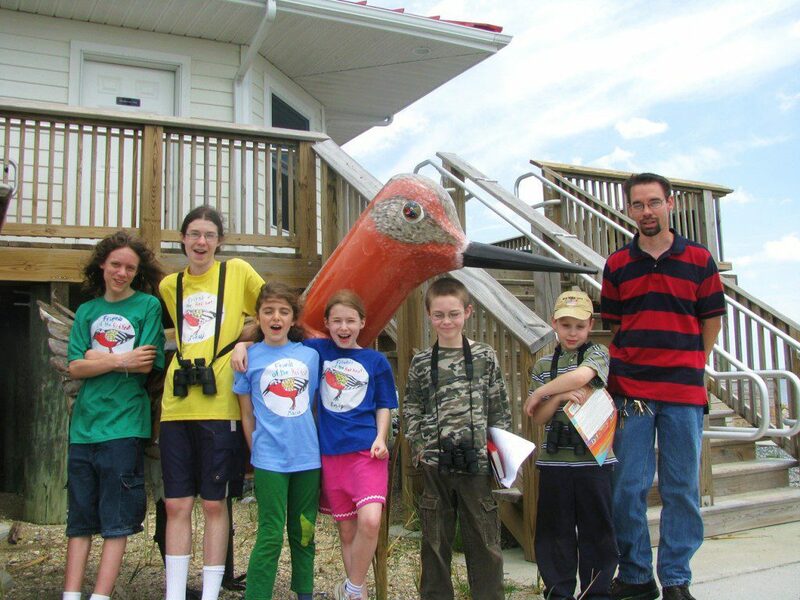 Our fair shores play host to millions of crabs and hundreds of thousands of shorebirds each spring. The birds are fueling up for the lengthy journey to their Arctic breeding grounds, while the crabs will simply return to the ocean to spend the next year cruising the bottom. The Friends of Red Knot group surrounds the giant Red Knot sculpture at the DuPont Nature Center. The Red Knot is an imperiled species whose population has crashed dramatically in the past decade, and whose very survival hinges upon the availability of large quantities of horseshoe crabs to gorge upon during their short visit each spring. The Red Knot’s future is very uncertain at this point. Do yourself a favor and treat yourself to a trip to see this spectacle in the last two weeks of May or into the first week of June. Visit Mispillion Harbor and the beautiful DuPont Nature Center to see the highest concentration of Red Knots in the world.